Read 2 times. Last read April 12, 2013. Oh what a wonderful read, I am still smiling! Thanks to Mary Eileen for recommending this book and then giving me her ARC. I just loved Park and I grew to understand and love Eleanor. Eleanor is big, awkward with bad clothes and bright red hair. She is the oldest of a very large family. Her mother makes bad choices with men and her latest stepdad is a drunk who beats his wife and when Eleanor expressed her hatred of him, her mother sent Eleanor away for a year to live with her brother and his wife. Now Eleanor and her brothers and sisters all sleep in one bedroom; there is no door on the bathroom and Eleanor doesn’t even own a toothbrush. Park comes from a family that is the opposite of Eleanor’s; always enough food, and love and support. It is Park and Eleanor who slowly, but surely find one another first through comic books, then music, then conversation. None of their relationship and then their romance is easy, but they find each other and hold on. I didn’t want to put this book down; I loved both of their voices and I especially loved how Park protected and fought for Eleanor and how he saved her through his actions and words. I want to read this book over again and again and I don’t ever say that. Sign into Goodreads to see if any of your friends have read Eleanor & Park. “Nothing before you counts," he said. "And I can't even imagine an after." She shook her head. "Don't." Just moved to the top of my to read list. I think I have an ARC at work. If not, I've ordered it for our library and happy to say it's checked out so someone else is enjoying it. I'll just have to wait my turn. I am so glad you enjoyed it as much as I did. Yes and someone also said a book along the same lines that is good- so Ineed to read this one also. It has gotten ALA awards. ooh i have seen that one, too! I loved this book! And yes read Aristotle and Dante soon! It's beautiful. These are 2 of my most favorite books that I read recently and know I will reread in the future. Tiff, I am definitely getting Aristotle and Dante! See you Friday! My students and I LOVED Eleanor and Park. And she even sent us a signed copy of her book! 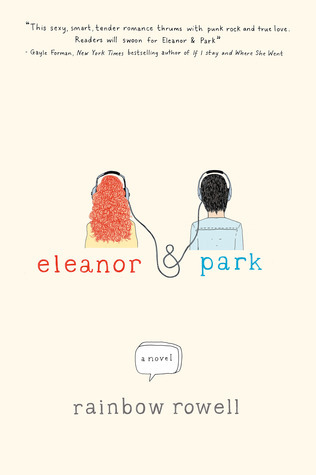 Teacherward wrote: "My students and I LOVED Eleanor and Park. And she even sent us a signed copy of her book!" I also listened to it and Park's voice resonates with me still.